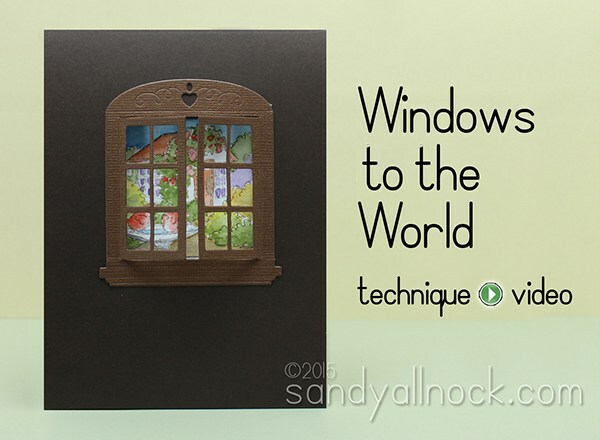 There’s just something I love about the interactiveness of cards that open – and now I can make window cards thanks to Art Impressions! The stamp line, which I had seen for a long while, has images in squares. Which were nice, but I hadn’t jumped on them for some reason. As soon as I saw the dies? Oh yeah baby! Give me a couple window sashes to open, and I’m sold! Check out the video below, or click HERE to watch in HD on YouTube. I hope you didn’t mind me talking my head off while making window cards about something that’s been bugging me for the last week or so! Just make sure you do what I asked. Wanna keep you safe out there! A lucky winner will be picked randomly from commenters on this post – Question: tell me what you see outside your window today! I’m curious! And on Monday I’ll announce the winner of a packet of a new couple Art Impressions stamps – one will be a Windows to the World stamp! I see rain, but happily it is not snow, very thankful. Love your window stamps and videos and the diecut will be bought next, hopefully you will have it at the Novi Expo in Detroit in May. I see snow melting and some grass turning green. Spring is coming! I see my garden and fence then trees. I love the window concept cards! You can show in or out and do so many things. I’m looking at my over grown backyard and the grapefruit tree with the fruit too high for us to pick! I love not having to deal with snow! I see a beautiful day the Lord has provided. I’m so blessed to be able to watch your videos. I don’t think there’s one that I don’t love. You do fabulous work. Thank you! Hi Sandy. As I look outside my window today, the sun is shining, which makes me very happy! Although the temperature is still a bit chilly for this time of year, I am so glad that spring has finally sprung!! Love your card, it is so very pretty. I especially love the window die used on the outside of the card. Thanks for the good tip on email addresses. When I look out my window I see the neighbors house and their little 2 year old chasing a little black and white kitty. Love this die set and stamp. Already have so many dies, but one more couldn’t hurt. Opps, forget to tell you that I can see daffodils, crocuses, grape hyacinth, big hyacinths and my bleeding hearts are budding. It’s Spring. Love it. Aloha sweet Sandy – Today was mostly partly cloudy, throwing some seeds down to the wild chickens of all ages who frequent our back yard, the yellow saffron finches, java finches, red cardinals and blue-ish mourning doves. We have a little white kitty who comes by 1-3 times per day for a few kitty crunches I throw down to him, which he loves (you know Whiskers Chicken flavor in the yellow bags). I always love seeing how you color and paint as I have totally bombed my watercoloring this last week. Color be blue ♥ Thanks for the heads up on the passwords. We have a pretty large garden in our back yard. All of the rooms on the back side of the house have glass doors that look onto it. I love the view, especially in Spring time. Lots of beautiful color! A cloudy day which is a huge blessing! We got some much-needed rain last night! I have Hummingbird feeders so that is what I am seeing out my window today. Hummingbirds are so fascinating to watch. I see some lovely budding oak trees and lots of small wildlife! And sunshine on top of it! Love this card and your colouring! I see sunshine, which in NY has been sparse this spring! The window cards are beautiful! Ty for sharing! Thanks again Sandy. Love the watercoloring. I’m saving for the large set of Kuretake as well. I’ve done what you asked in the video. I use an App for that!!! Have a blessed day!! The card is so pretty! Thanks for sharing. As to the view out of my window, I’ve been seeing lots and lots of rain and subsequently lots of green. Here is Alabama we have been having a wet spring but things that grow are very happy. There are some mountains near where I live and my commute to work is a lovely view of burgeoning trees, bushes, vines and grass, (We’ll pretend the weeds aren’t there).